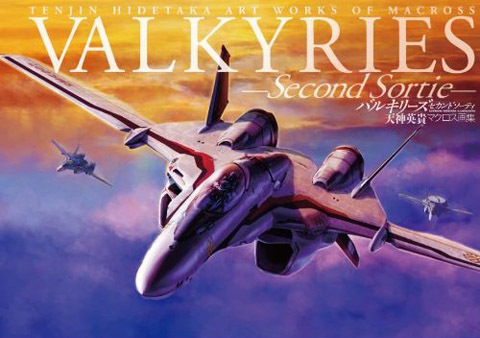 Following on from Hidetaka Tenjin’s previous Valkyrie themed book, it seems that we will be graced with yet another wonderful entry called Valkyries Second Sortie. As the cover suggests, it seems that this edition will also be more focused towards the recent Macross Frontier. As with all of Tenjin’s work, this will be a must buy on its release later this month. Make sure to pre-order it now! What with Wonder Festival 2011 Winter going on, a bunch of places online have been reporting the event. Whilst the unnerving majority of the figures being shown are of scantily clad ladies, there are also still a fair few mecha on display. 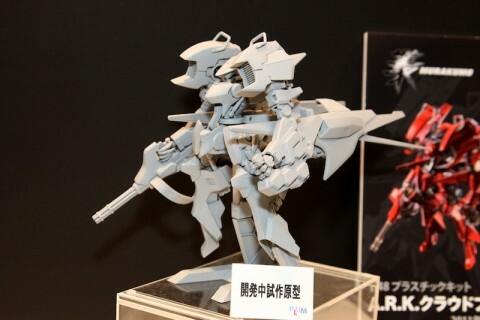 Specifically the announcement of a RIOBOT figure of Detonator Orgun, that was featured in Super Robot Wars W, to the somewhat more niche Cloud Breaker 01 kit from Murakumo. Whilst this is yet another cool looking kit from PLUM, of prior Leynos fame, the Murakumo mecha are curious due to the man who penned them. 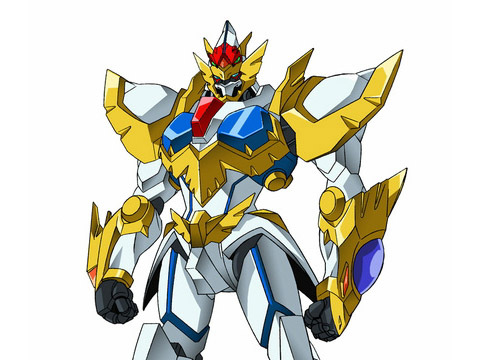 Specifically, that of Takayuki Yanase who’s had a rather gilded career as a mecha designer in his own right since he left From Software. Something that From Software have been keen to capitalise on, as this design was featured (albeit modified) in the first Another Century’s Episode, not to mention the Ixbrau units Yanese exclusively designed for Another Century’s Episode 3. He even worked on the OG mecha for Super Robot Wars W too. In any case, whilst Murakumo was a pretty wonky game the designwork was lovely. So this is yet another kit that’s been added to our wish list. If you want to have a gander at the remaining reportage for the current Wonder Festival, then GA Graphic and AkibaHobby (pages here and here) should satiate your needs. A mild warning though, as some of those links aren’t exactly work safe. We’ve also included some videos of the Cloud Breaker 01 in action below. One of the largest Perfect Grade kits has finally been released, that of the ZGMF-X20A Strike Freedom Gundam from Gundam SEED Destiny. Coming in at a whopping 26,250 yen, like the other Perfect Grades it’s hardly very affordable. However, this price tag isn’t without reason; as the sheer engineering involved in the manufacturing of these plamodel beasts is suitably epic. Unsurprisingly, this mobile suit has been in numerous games over the years and the upcoming Gundam Musou 3 will also feature the mecha. As with almost all Bandai Gundam kits, Hajime Katoki has a hand in the sculpt and engineering. This can sometimes cause issues with the sculpt on certain designs (original design here), as he has a habit of somewhat standardising them. 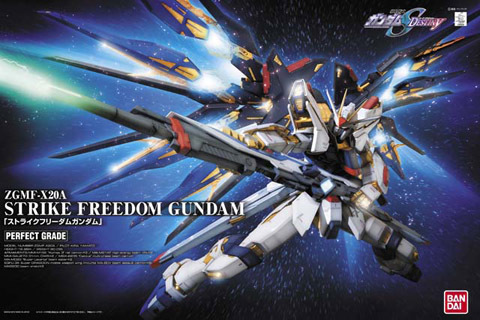 The Strike Freedom seems to be mostly okay on this front though. In any case, you can buy this impressive kit over at HLJ and they’re even holding a Perfect Grade sale too. Super Robot Wars L was released today in Japan (you can buy it here). This is the latest game in the series to be hosted on the mighty DS and despite the extensive asset re-use, we’re still moderately pumped to play it. Separately, the next Composite Ver. Ka toy will be that of the PTX-EX Exbein from the recent OG anime The Inspector. As with all Ver. Ka treatments it’s definitely been given the patented Katoki flair, but that’s not surprising from a mecha with shades. 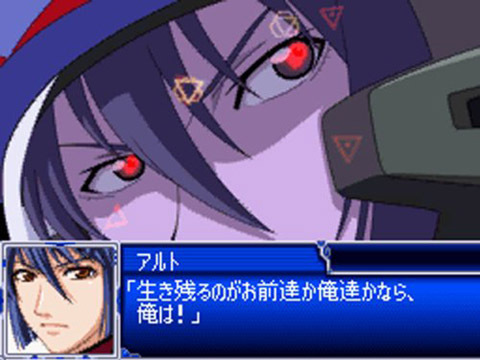 Finally, there have been rumours floating around about a new PS3 2D SRW game. 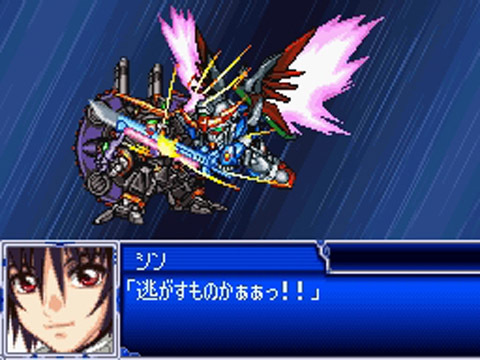 Entitled Super Robot Wars U, it would apparently feature mecha from Armored Core Nexus and Front Mission amongst a slew of others (even including Tetsujin 28-go). The only thing is that the article in Famitsu that “announced” it was actually meant as a hypothetical piece. So it’s not really a fake game per se, as Famitsu never intended the exercise as such, but it won’t be getting made any time soon. Whilst an obvious pity, as the line-up was several orders of epic, here’s hoping Banpresto follow it up with a real PS3 SRW announcement. It seems mecha games have gotten one last hurrah out of the Nintendo DS with the release of the eagerly anticipated action RPG Solatorobo. No word yet on whether the game will get a Western localization, but since we’ve seen Solatorobo in French there is certainly reason to be cautiously optimistic. It’s interesting to note that for what is likely considered to be a longshot in the games industry these days–Solatorobo not being a direct sequel to a well-known property nor being a cash-in on another successful game’s genre–Solatorobo had quite an advertising campaign associated with it, with no less than one hundred commercials being played on a single TV station, all within eight hours. That’s one hundred different commercials, mind you. If you’re as incredulous as I was, you can check the official website and watch all 100. They spend a large portion of that airtime fleshing out the game’s world, talking about the kinds of foods that dog and cat people eat and the kinds of shoes they wear, in case you ever had questions about dog and cat people living in Victorian-era floating islands but were always too afraid to ask. 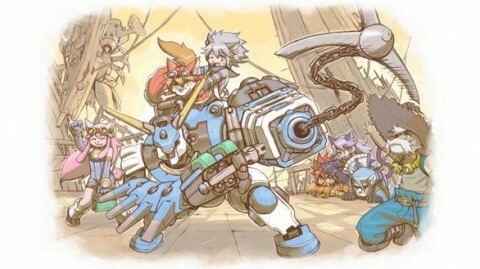 It’s a rare glimpse into a fully realized world, rather than the usual slapping together of standardized video game and anime tropes, and it’s amazing (and perhaps slightly frightening) how much work CyberConnect2 put into making the world of Solatorobo feel alive. I find myself wishing that developers of “open world” style games put that much thought into their releases. If you, for some reason, still prefer your trailers to focus on the actual game, you can see a quite nice one here. What with the release of Super Robot Wars L very near now, the longer and more interesting promo videos start getting distributed to Japanese stores. Thankfully, these also get uploaded online. This latest promo for the game goes through many of the notable signature attacks from the various series the game features. From the pretty bloody amazing Great Mazinger and Mazinkaiser cutscenes, to the less great Gundam Wing Endless Waltz re-hashes, the game covers the gamut in terms of animation quality (or lack thereof). Of all the units we’re most interested in though, it would have to be those from Iczer-1 and Iczer 3; as they warm the cockles of our 80’s heart. The full promo is shown below and you can pre-order the game here. The upcoming Super Robot Wars L has received its first set of TV adverts in Japan. The adverts show the insert animations for most of the new mecha featured. The somewhat cunning and more than a little bit misleading aspect of how these have been depicted is that Banpresto have linked them all together as an edited whole. In reality, the inserts are very short-lived in the game and the vast bulk of the actual animation is sprite based and reliant on the heavy re-use of assets from the previous DS and even GBA titles. That said from what we played of the game at TGS it was at least fun, so we’ll see on the game’s release at the end November whether the budget animation will wind us up. The videos are linked below. The ongoing Tamashii Nation 2010 show has received various bits of coverage, with AkibaHobby’s being one of the most extensive. From the White Dingo GM Sniper Mk.II variant Robot Damashii shown above (still no release date though), to a veritable avalanche of Super Robot Wars OG toys, from the PTX-007-03C Weißritter, to the the R-Series (as in R-1, R-2 and R-3). 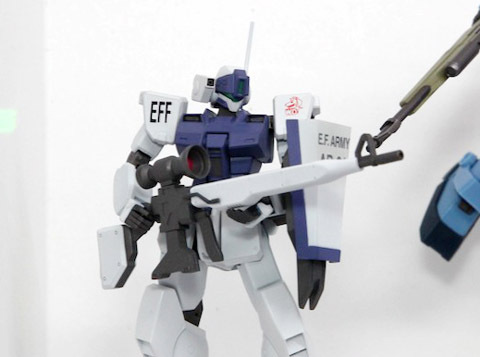 The latter offers the potential for a chogokin SRX down the line (with some anime/engineering magic). In any case, this year’s show has had a lot of surprises. Notable of which is the teaming up of Studio HalfEye and Bandai to make a new transformable Escaflowne chogokin, most probably based on the older and very expensive garage kit. Hopefully it will be better than the awful Yamato toy. Whilst it’s somewhat kept quiet, Escaflowne did receive a PSone game back in the day (but as you probably guessed it was a bit dire). Even the Ver.Ka Temjin made a showing too, as well as a brief presence from Dann of Thursday from Gun X Sword. All said and done though and it is admittedly not in a mecha game at all, we’re also very excited about the announcement of the Gunship from Nausicaä in Bandai’s new Formania line. Put simply, it looks bloody amazing. 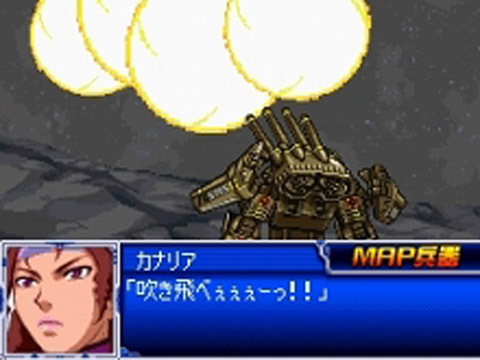 Game Watch has some coverage today about the upcoming Super Robot Wars L on the DS. From the partner battle system, that’s rather functionally familiar, to the new OG characters and mecha – the update covers quite a bit. The OG mecha specifically, Rushbird, was the starting unit used in the TGS demo we wrote our impressions on. It’s obviously a design at the super end of the spectrum but it has quite a classic aesthetic to boot, almost Braves-esque. The game is still set for its late November release in Japan. 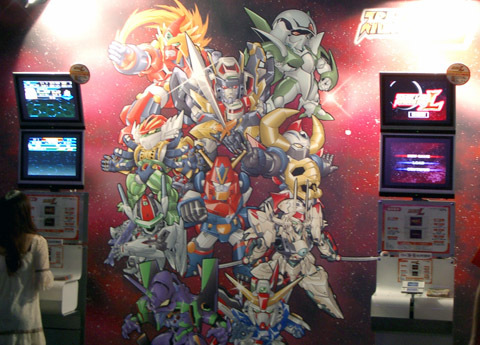 There were only four DS’s at the show that graced the upcoming Super Robot Wars L and the demo only had the first level in the game, as far as we can make out. The booth also had the latest OG anime trailer blaring away above it, which also added to the atmosphere a fair bit. Hit the jump for our impressions.